Season 3 Of Ningalkkum Akam Kodeeswaran 2014 Is Coming Soon on Asianet. Ningalkkum Akam Kodeeswaran 2014 is the 3rd Season of The Game Show. Malayalam Super Star Suresh Gopi is the Host The Past Two Seasons. 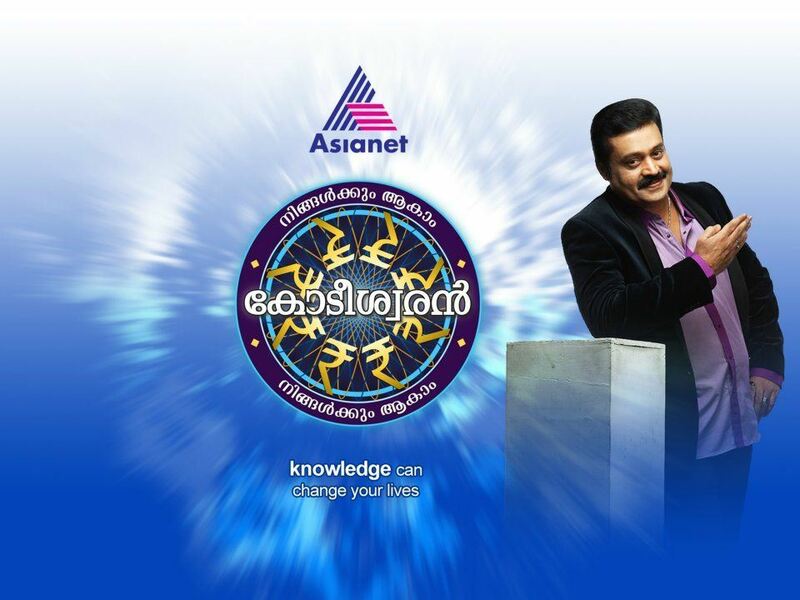 Suresh Gopi Is The Host Of Ningalkkum Akam Kodeeswaran Season 3. NAK is the Malayalam version of You Can Become a Millionaire.Asianet Started the Show Ningalkkum Akam Kodeeswaran’s First Season on 9th April 2012. Shyla C.K, a Contestant at Ningalkkum Akam Kodeeswaran Wins 50 Lakhs. NAK Season 2 Started on 4th March 2013. Ningalkkum Akam Kodeeswaran Season 2 Witnessed The First Kodipati.Sanuja Becomes The First Kodipathi In Ningalkkum Akam Kodeeswaran. Stay Tuned Keralatv.in for the Audition, Call For Entry and All Other Details of Ningalkkum Akam Kodeeswaran 2014. Its Expected to Launch After Completing Delishus Star Singer Season 7. This is a wonderful gameshow and a platform for a layman. Looking for another chance to utlize the platform for helping the people of my home state. i am interested in ningalkkum akam kodeeswaran season 3, please accept me. we are waiting for the ningalkkum akam kodeeswaran season 3 questions. I am Sunny from London,eagerly waiting for this program-me from last year onwards because on season 1 I attempt many questions on same time, but unfortunately i don’t know how it is missing. It is not to become a Cr pat hi but just to attend once that how much I have confident to attend the questions.On 2012 I was in Kerala so it was easy to give the answer,but this time I am in London i don’t know the procedure how to give the answer, if you email me the procedure then I can be know. So this time i hope that i will be able to attend. I am MohandasMadhavan writing this from Los Angeles , California USA.Presently staying with my son. This program in Asianet is highly informative and quizy. It is watched eagerly by Malayalees in all parts of the world. It explores the hidden treasures in the world of knowledge and is presented with most professionalism by Bharat Suresh Gopi. We are wating for Season 3. We are natives of kottayam.Iwas working in Indian Telecom Dept as Deputy General Manager of one district in Kerala .Iam very eager to take part in this show.Kindly let me know the procedure for taking part in show by mail.Iwill be back in Kerala by December. Reference to episode dated 12 January, please let me know the name of speech therapist who treated daughter of contestant Elsina of north Beypore. Name of the child is Mithra. This is for treatment of my grand daughter who has speech problem. In one of the earlier episodes a question was asked: which is the most expensive metal? Diamond was one of the choices. While the contestant could not answer the question the host (Suresh Gopi) gave the answer as diamond. This was a wrong answer because diamond is not a metal but just carbon and a very expensive gemstone. The costliest naturally occurring metal is rhodium whose market price was $39641/kg on 31st December 2014. HOW TO DOWNLOAD HOT STAR???? ?